શાકભાજી એ વનસ્પતિના ખાઈ શકાય તેવા કોઈ પણ ભાગને કહેવાય છે. શાકભાજીમાં વનસ્પતિનાં પર્ણ, ફળ, ફૂલ, પ્રકાંડ તેમ જ મૂળ એમ કોઈ પણ ભાગનો સમાવેશ થાય છે. વિજ્ઞાન અને સામાજીક દૃષ્ટિકોણથી શાકભાજીની વ્યાખ્યા અલગ અલગ હોય શકે. જેમ કે, મશરૂમ શાકભાજી ગણાતુંં નથી કે ટામેટાને ફળ કહેવાય, વગેરે. ફળ(વૈજ્ઞાનિક સમજૂતી): તે વનસ્પતિ અંડાશય છે જેનાં દ્વારા તે તેનો વંશવેલો ટકાવે છે. ફળ(સામાજિક સમજૂતી): વન્સ્પતીનો એવો ભાગ કે જે સ્વાદમાં મીઠો હોય અને જેમાં વનસ્પતિના બીજ હોય. Vegetable: any edible part of a plant with a savory flavor. 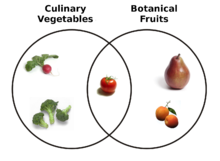 In everyday, grocery-store, culinary language, the words "fruit" and "vegetable" are mutually exclusive; plant products that are called fruit are hardly ever classified as vegetables, and vice versa. For scientists, the word "fruit" has a precise botanical meaning (a part that developed from the ovary of a flowering plant), which is considerably different from its common meaning, and includes many poisonous fruits. While peaches, plums, and oranges are "fruit" in both senses, many items commonly called "vegetables" — such as eggplants, bell peppers, and tomatoes — are technically fruits, as are most cereals, as well as some spices like black pepper and chillies. Some plant products, such as corn or peas, may be considered vegetables only while still unripe. The question of whether the tomato is a fruit or a vegetable found its way into the United States Supreme Court in 1893. The court ruled unanimously in Nix v. Hedden that a tomato is correctly identified as, and thus taxed as, a vegetable, for the purposes of the 1883 Tariff Act on imported produce. The court did acknowledge, however, that, botanically speaking, a tomato is a fruit. Whole-plant sprouts: soybean (moyashi), mung beans, urad, and alfalfa. Roots: carrots, parsnips, beets, radishes, rutabagas, turnips, and burdocks. There are a series of ISO standards regarding fruits and vegetables. ↑ Woodruff, Sandra L. (1995). Secrets of Fat-Free Cooking : Over 150 Fat-Free and Low-Fat Recipes from Breakfast to Dinner-Appetizers to Desserts. Garden City Park, N.Y: Avery Publishing Group. ISBN 0-89529-668-3. OCLC 33142807. ↑ Whitaker, Julian M. (2001). Reversing Diabetes. New York: Warner Books. ISBN 0-446-67658-6. OCLC 45058465. ↑ Steinmetz KA, Potter JD (1996). "Vegetables, fruit, and cancer prevention: a review". J Am Diet Assoc. 96 (10): 1027–39. doi:10.1016/S0002-8223(96)00273-8. PMID 8841165. ↑ "67.080: Fruits. Vegetables". International Organization for Standardization. Retrieved 2009-04-23. વિકિપુસ્તકોનાં રસોઈ પુસ્તક પર આ વિષયક વિગતો ઉપલબ્ધ છે. વિકિમીડિયા કૉમન્સ પર શાકભાજી વિષયક વધુ દ્રશ્ય-શ્રાવ્ય માધ્યમો (Media) ઉપલબ્ધ છે. આ પાનાંમાં છેલ્લો ફેરફાર ૧૨ માર્ચ ૨૦૧૯ના રોજ ૧૨:૪૯ વાગ્યે થયો.